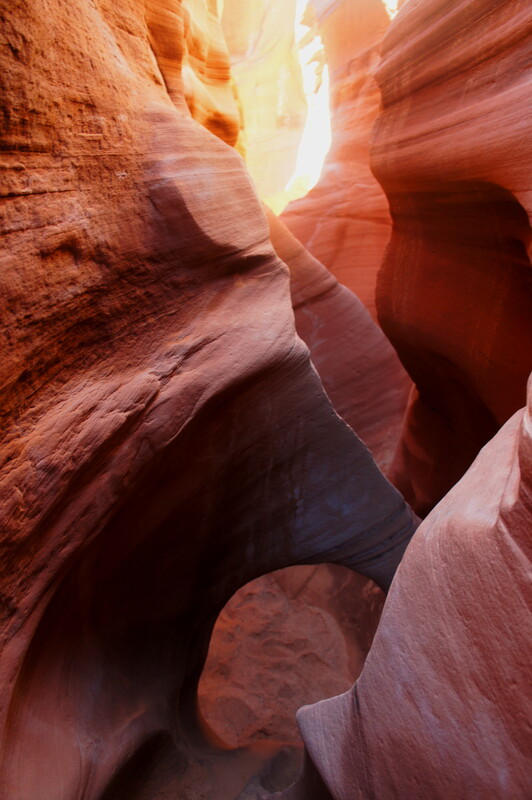 In the American Southwest, slot canyons are, simply put, an addiction. So exceptional are these deeply-incised sluices in the sandstone of the multihued Colorado Plateau that once you have tried a taste, it’s nearly inevitable that you’ll come back for more. The addiction knows no bounds; the state of Utah alone boasts perhaps a lifetime’s worth of narrow slots, each with a unique flavor. (Note: See my sparse, but growing, list of Utah slots here.) To the adventurous, challenging obstacles—chockstones, chilly pools, potholes, and tricky pouroffs—add to the allure. Many require the use of ropes and harnesses to descend; others can be mastered without. 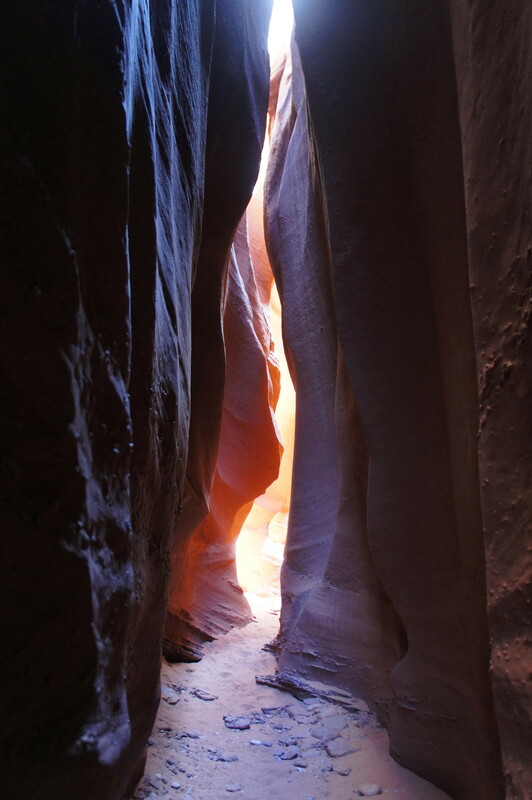 Peekaboo and Spooky slot canyons, situated deep in the heart of the 1.8-million acre Grand Staircase-Escalante National Monument, also belong on the list. Short but spectacular, Peekaboo Gulch features vibrant-colored walls and two golden arches. 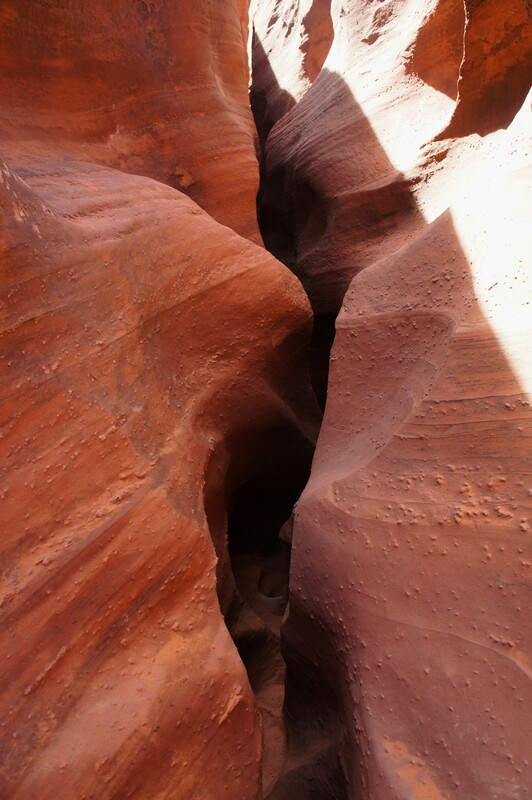 Spooky Gulch lives up to its name: shadowy, sinuous, and intensely narrow. 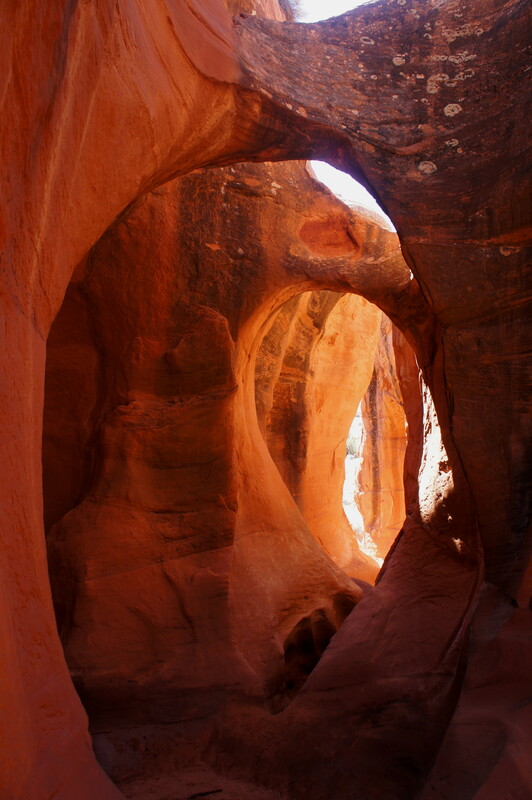 These are the most popular of a quartet of slots (the others being Brimstone Gulch and the Dry Fork Narrows) within striking distance of Escalante’s iconic Hole-in-the-Rock Road. 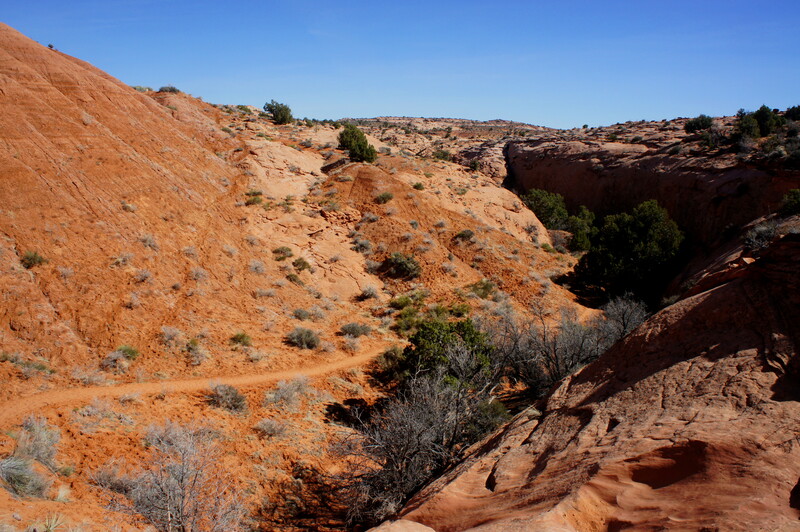 Despite being a popular destination for hikers of a wide range of abilities, the circuit described—up Peekaboo Gulch, down Spooky Gulch—is a challenging trip. While only around 3/10 miles in length, both slots include minor dryfalls, boulder jams, and other obstructions that require strength and careful footing to negotiate. Entering Peekaboo from the bottom involves a potentially harrowing, 15-foot Class 3+ climb that can be downright dangerous when wet, while a boulder choke in the upper half of Spooky requires a 7-foot drop down a dark and narrow chute between chockstones. Caveats aside, all kinds of groups—from elderly couples to small children—can be found navigating the two slots. Though popular, the hour-long drive down the remote, bumpy Hole-in-the-Rock Road leaves Peekaboo and Spooky less congested than, say, the Zion Narrows or Little Wild Horse Canyon. Accessing the Dry Fork Trailhead can be a protracted endeavor. Leaving Highway 12 five miles southeast of the town of Escalante, follow the graveled (and often washboarded) Hole-in-the-Rock Road for 26 miles. (Note: check updated road conditions here.) Turn left onto a signed, dirt track bound for Dry Fork. This road is significantly rougher, defined by deep ruts and sideways slopes. It is around 1.6 miles from the original left turn to the trailhead, but ordinary passenger cars should not venture beyond halfway, where the drive gets significantly rougher and rockier, demanding at least high clearance and perhaps four wheel-drive. In this case, visitors may park in a wide parking area 7/10 mile in and walk (or hitch) the remaining 0.9 miles. 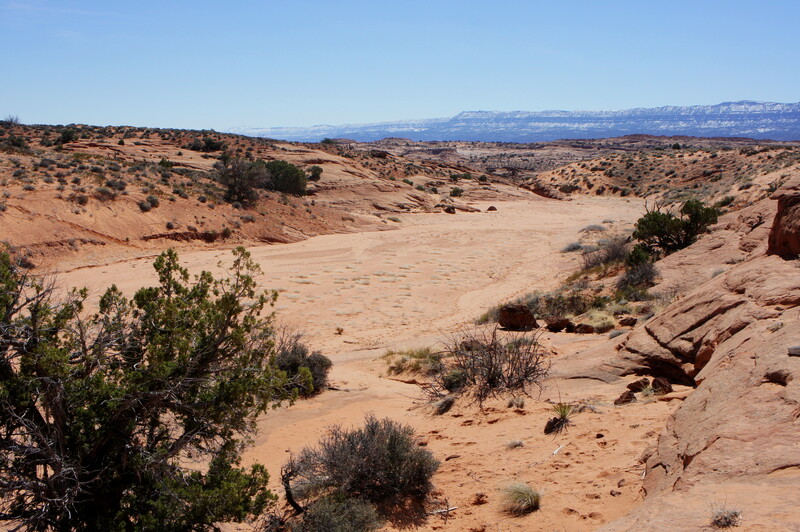 The Dry Fork Trailhead sits on the precipice of the south rim of the Dry Fork of Coyote Gulch, here a relatively shallow—but immensely colorful—canyon. Sign in at the trail register before descending the 200 feet to the valley floor, where the slots begin. 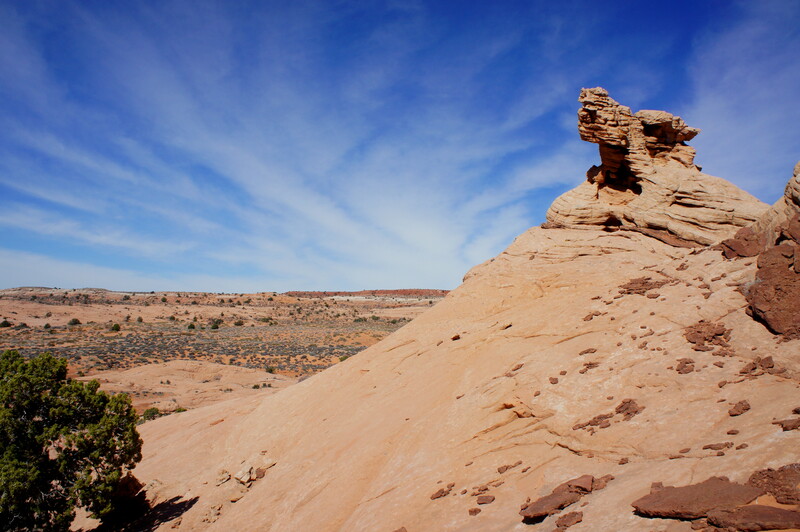 The first half of the approach requires switchbacking down a series of slickrock benches, following rock cairns. At first cutting east, the route doubles back to the west, edging down to a minor draw where a dusty footpath can be found. 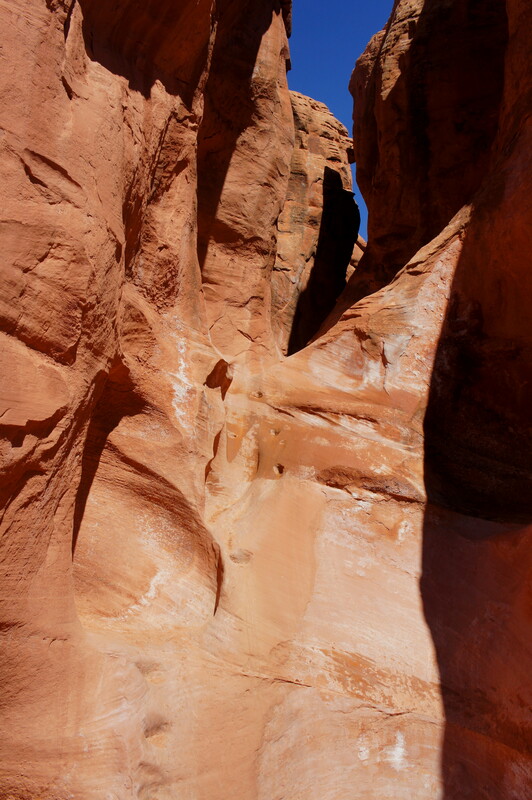 Follow this trail, rather easy to discern, down to the sandy gulch, bounded on the right side by a sheer wall of Navajo sandstone. 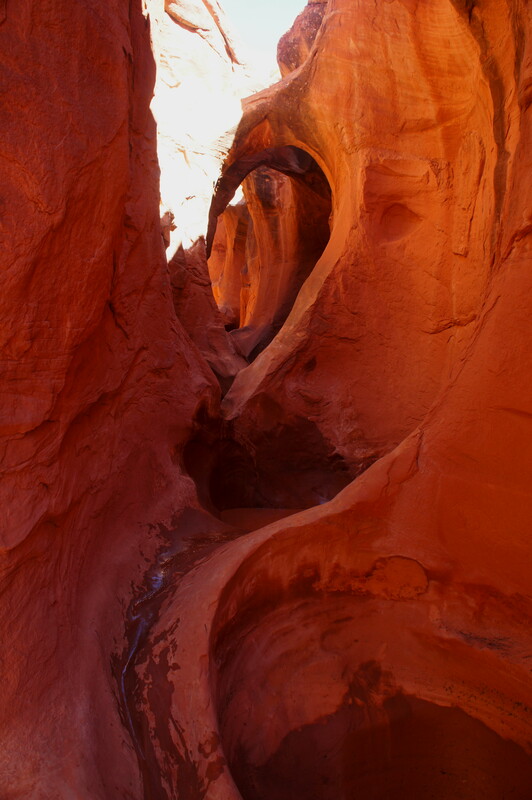 Within minutes, this ravine merges with the main drainage—the Dry Fork of Coyote Gulch. From here, without a good map or sense of orientation, confusion reigns. 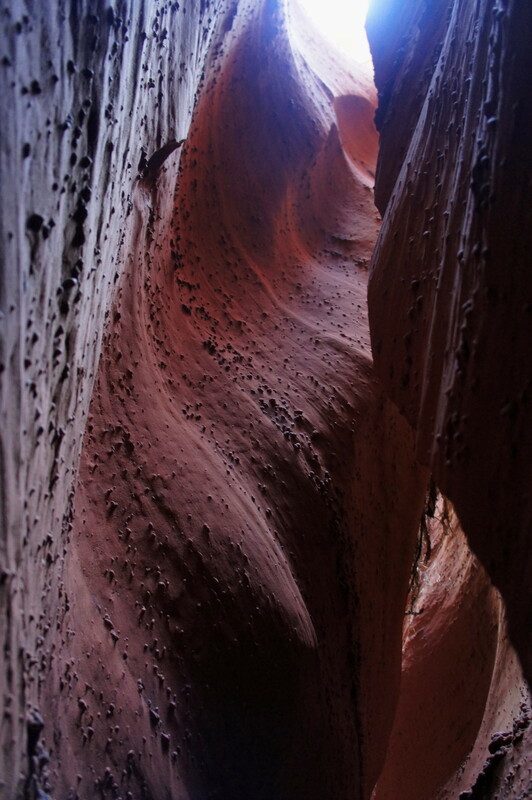 Hikers will likely be tempted to first bear left, where the Dry Fork visibly cuts into the Navajo sandstone, forming a deep cleavage. This, however, is neither Peekaboo nor Spooky; rather, it is the start of an interesting, ½-mile constricted section of the main drainage known as the Dry Fork Narrows. (Note: it has also been called the “Eerie Slot.”) The narrows do offer a nice preview, however, and are worth the detour, time permitting. 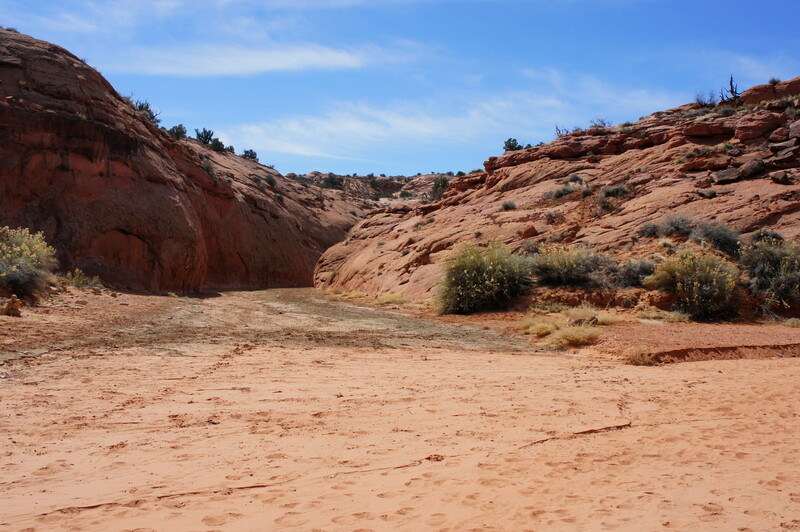 The entrance to Peekaboo Gulch is reached within a couple minutes’ walk in the other direction—down the wide and sandy wash bottom. Look for the crevice, fronted by a 15-foot pouroff, on the left (or, on a crowded day, simply follow the crowds!). The entrance to Peekaboo slot can be daunting to many. More than a mere scramble, the 15-foot dryfall requires the use of hands, careful balance, and a good deal of strength to surmount. Inexperienced climbers may benefit from the use of a rope and “spotters” to break a potential fall. Fortunately, a series of Moki steps have been chiseled into the rock to assist climbers, but a few of them are faded or consist of little more than a divot. Be especially careful in the top half of the ascent, which is exposed and lacks reliable handholds and footholds. Upon conquering the tough entrance approach, the good news is that the rest of the loop hike will not require anything quite as difficult. The bad news, especially in winter or after recent floods, is that the next section often holds chilly water. With Peekaboo’s iconic double arches within sight, hikers must first clamber around—or through—three 3- to 4-foot potholes. The first two can be avoided with relatively ease by skirting the wall on the left. The third, however, almost certainly requires a plunge. (Note: On my visit in March 2015, the water was about knee-deep.) The climb out of the cavity can be difficult, even when bone dry. Once clear of the three potholes, it is relatively smooth sailing to the double arches, a spectacular and photogenic sight. Beyond, Peekaboo Gulch bends and twists through sinuous curves. 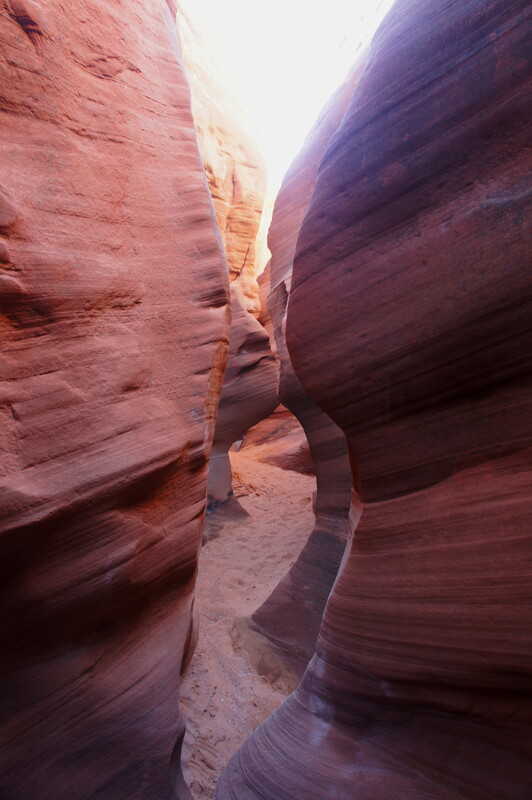 While the slot is not particularly deep (the walls are no more than 30 feet high), it is immensely colorful, and diagonal bands known as cross-beds contribute to an aesthetic beauty that is nearly unparalleled (rivaled only by perhaps a handful of other slot canyons in Utah). While Peekaboo rarely narrows to shoulder width, it is thin enough to require a delicate dance when encountering other hikers. (Note: Hiking etiquette generally suggests yielding to uphill hikers.) At one point, the path of least resistance runs through a minor, 2- by 3-foot arch, and sharp gooseneck bends must be tackled one hiker at a time. As Peekaboo angles northeast, the going gets easier, and the slot gradually opens up. The threadlike, slickrock tread—at a couple points no broader than the width of a hiking boot—gives way to a sandy, flat bottom. 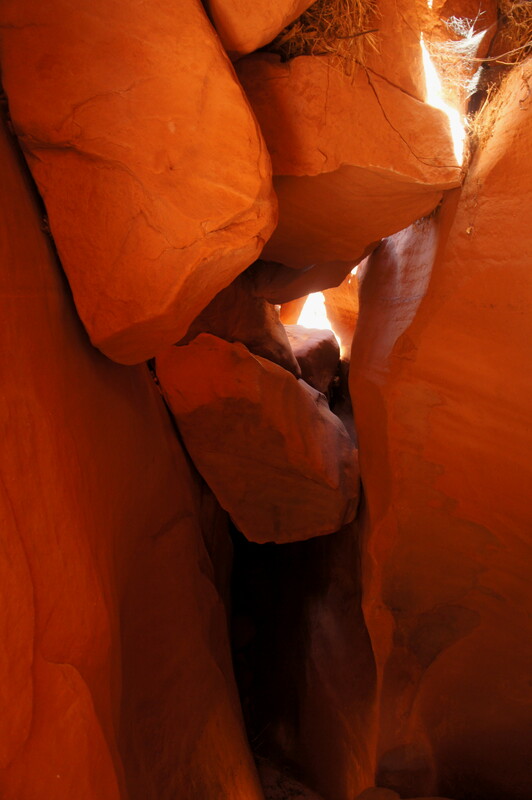 Around halfway to the top of the slot, the canyon briefly widens to around 15-20 feet. But Peekaboo is not finished—the wash soon enters a second set of narrows. A spiraling pouroff through a narrow squeeze poses the biggest obstacle in this section. To continue the loop—up and out of Peekaboo, then over to Spooky Gulch—exit the wash at the cairn. A worn footpath, sporadically cairned, bears east across the open Cat Pasture toward a chalky butte. Enjoy stupendous views from a low saddle to the right of the butte: a multihued landscape of orange Entrada sandstone and ruddy Carmel to the north; the towering Straight Cliffs, composed of newer rock layers, to the south. Beyond the outcrop, hiker footpaths are interlaced with cattle trails (in December 2014, a stray cow got itself stuck in the slot at Peekaboo Gulch), making route-finding rather more difficult. 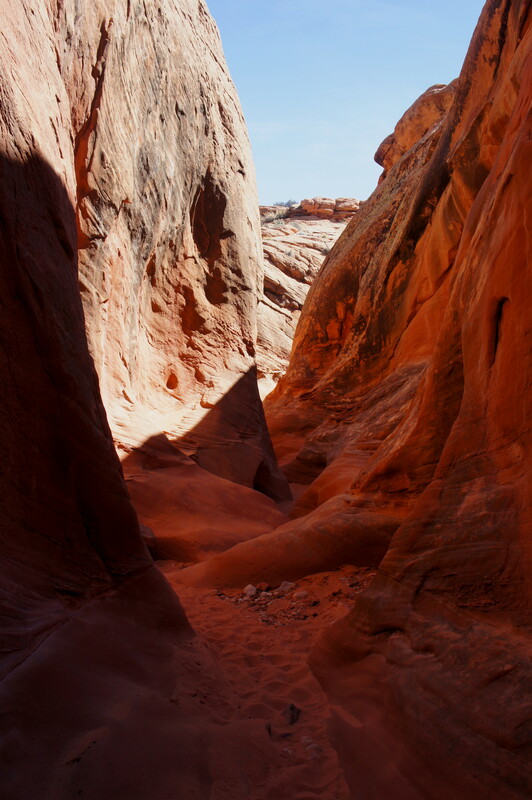 Nonetheless, hikers with a decent sense of direction will have little problem meandering over to the next drainage—Spooky Gulch. At this point, Spooky is wide and very sandy; work your way downstream (south) to the start of the lower (and most impressive) slot section. The distance between the Peekaboo and Spooky slots comes out to around 4/10 mile. Beyond the boulder jam, you are committed to navigating one of the thinnest, darkest, and—obviously—spookiest slot canyons in Utah. 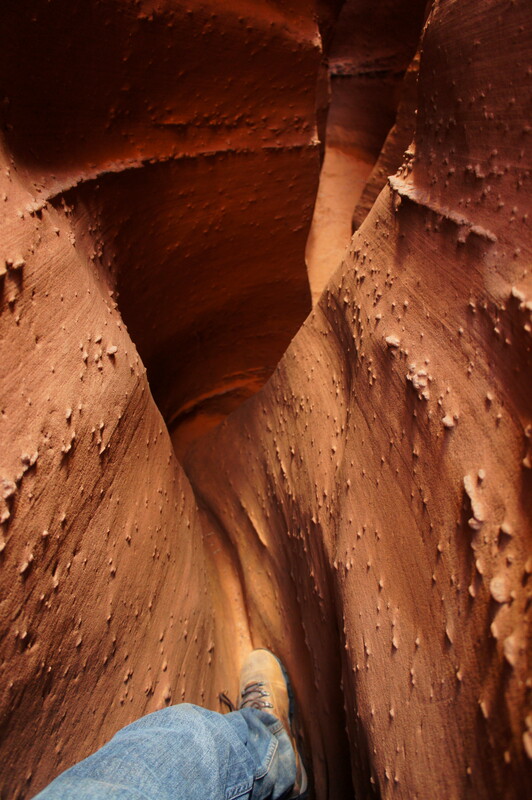 5-10 minutes down-canyon, the slot appears to drop a level—into a dark wedge so confined that the sandy bottom virtually disappears in places. Several spots require walking sideways, and backpacks must be removed and carried by hand. 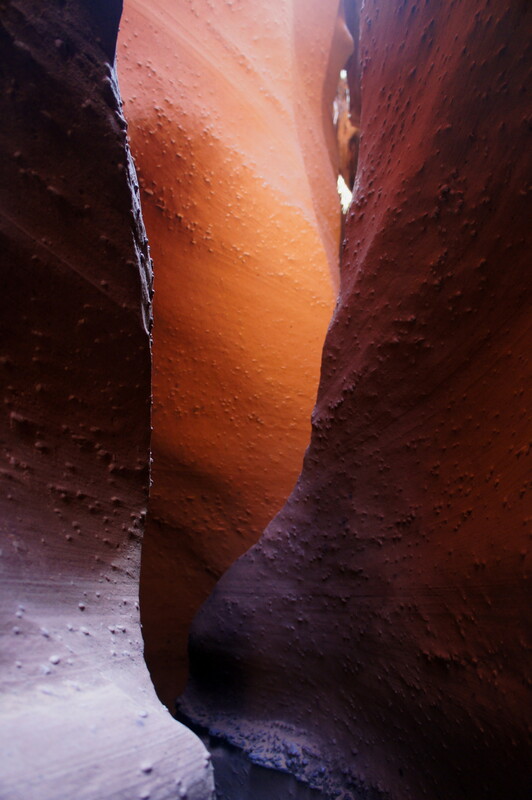 While not the best hike for the claustrophobic, Spooky Gulch is a magnificent spot for photographers—each bend and twist reveals a new, spectacular wall or passage, illuminated intermittently by tiny rays of light. Roughly midway through Spooky, a spiraling, 5-foot pouroff is perhaps best descended with a controlled jump. The slot continues for another 1/10 mile, gradually opening up to splendid narrows. Around 1/3 mile from the start, the narrows abruptly end—finally revealing the full sun again at long last. The alternative, shortcut route is to catch a hiker-made trail, shortly after exiting the Spooky slot, bearing southwest through a minor ravine. The route ascends gradually to a low pass, then descends a brushy gulch leading back to the Dry Fork. From here, it is only about 1/3 mile back to Peekaboo and the turnoff to the Dry Fork Trailhead. …Or double your time spent in the area by exploring the breathtaking slot in nearby Brimstone Gulch (about 1.1 miles from the bottom of Spooky), as well as the easily-accessible Dry Fork Narrows (at the bottom of the entry route, on the left). 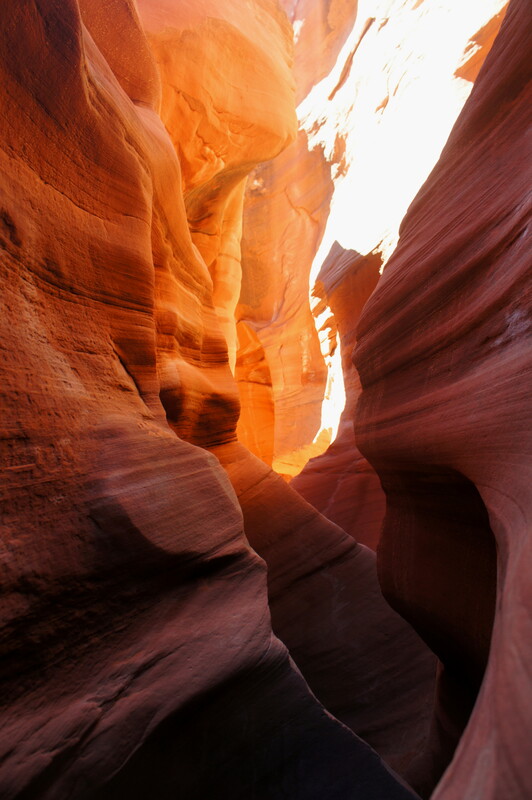 It is also possible to continue north up Peekaboo or Spooky Gulch to additional slots, though they are not as impressive as the terrain covered in this post—some of the finest slot canyons in the American Southwest. 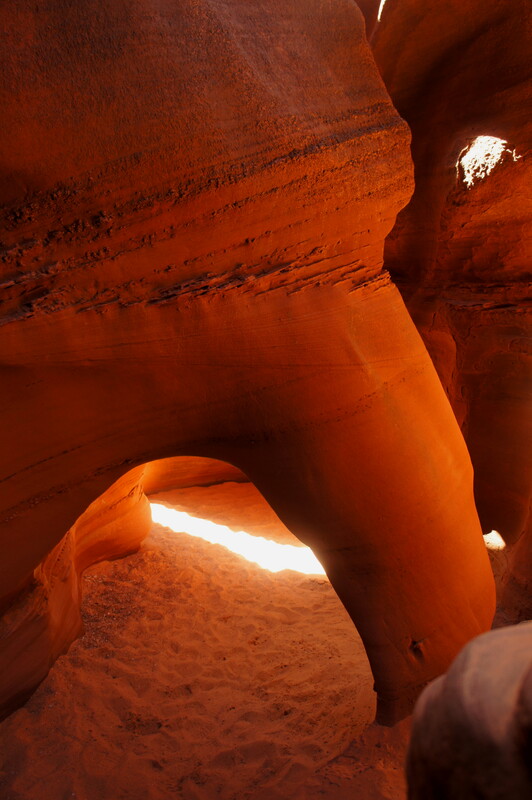 This entry was posted in Grand Staircase-Escalante National Monument, Strenuous Hikes, Utah and tagged arch, best slot canyons, canyon, Cow Pasture, Dry Fork of Coyote Gulch, Dry Fork Trailhead, Escalante, Grand Staircase-Escalante, Hole-in-the-Rock Road, loop hike, Narrows, Navajo sandstone, Peekaboo, Peekaboo and Spooky, Peekaboo Gulch, slot, Spooky, Spooky Gulch, Utah. Bookmark the permalink. This is where we are heading next week. Looks like we can get all four in at once and not have to make the drive again. Great photos of what to expect! Great! Definitely worth making the journey to Brimstone – probably my favorite of the bunch: the deepest, darkest, narrowest, and most mysterious. Only downside? It’s often filled with icy water about 2/10 mile of the way in. But worth the trip regardless. Well, Andrew, it looks like the slots will have to wait til next year. We drove to Escalante from Torrey yesterday just for something to do since the weather is so terrible. It was snowing at 9600′ and we had slush on the roads as we returned. That 25 mile up hill climb sure won’t be fun in our 40 ‘ motorhome and then we return this way in just a week. So we canceled our visit there and are going to stay in Torrey another week. I’m glad you have several posts on Capital Reef. We are planning to do Meeks Mesa one day and Castle Rock, if it ever stops raining. We didn’t know anything about Castle Rock. I like the Hoodoos. We are going to do Upper and Lower Calf Creek from here. Thanks for the great posts!! You’ve been very helpful. Dude. DUUUUDEE. 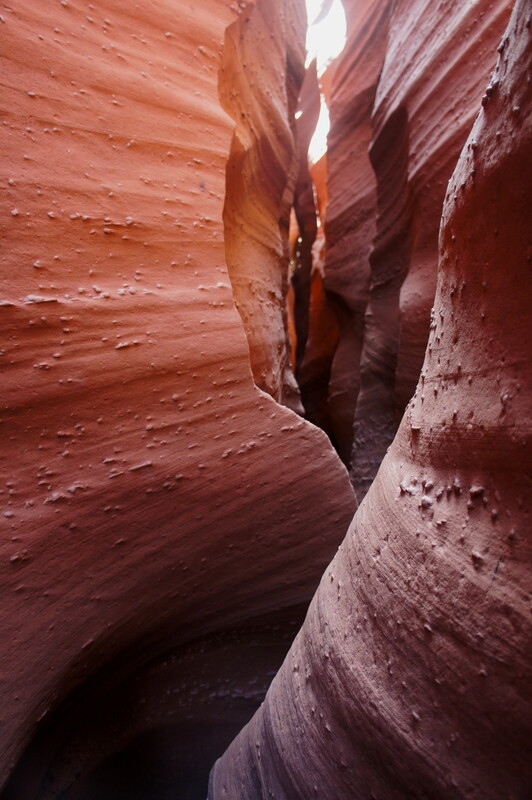 I’ve been salivating over slot canyons for a while. Thanks for the writeup. Awesome write up and pics! We’ll def be referring to this for our visit this fall… Thanks Andrew! Do you think there will be water in the potholes this time of year? Hi Chris – it depends on how much rainfall there has been recently, but traditionally fall is a decent time to avoid the two biggest contributors: summer thunderstorms and snow. Often the latest road conditions can offer clues: https://www.nps.gov/glca/learn/news/road-conditions.htm. If lots of the roads are impassable due to mud or snow, there is probably a better chance there is rainwater that has collected in the potholes. Hi Andrew, great post, very informative. One question, though. I was wondering if there was/is any possibility to only hike the Peekaboo portion and then walk back to the car (so leaving out Spooky) instead of hiking the entire loop. Also, what I mean is not to hike back through Peekaboo in the opposite direction, but instead returning over a flat(ter) surface. What are your thoughts on that? Is that even possible? Hi there – in theory that sounds plausible; you can certainly cut south across open terrain once you get to the end of Peekaboo. However, I’m not sure if you’d hit a drop-off coming back into the Dry Fork of Coyote Gulch, which you would have to cross to return to the car. Great post and super pics, thanks. I’m headed for this area at the end of May and have 5 nights to enjoy it, a brother in law with some slot experience and two vehicles. 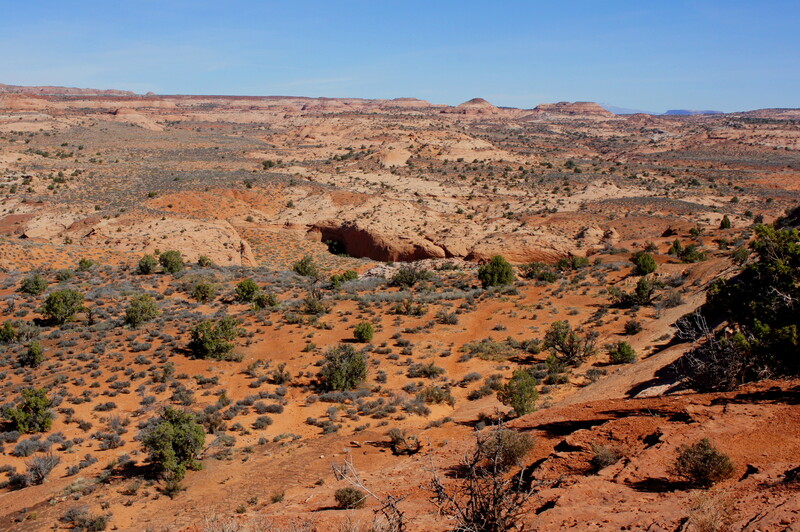 How realistic do you think it is to leave a vehicle at the Fortymile Ridge trailhead, shuttle back up to start at the Dry Fork, do the slots for a day or two and then hike down to the Escalante River and exit Coyote Gulch at Crack-in-the-Wall? Your post has been truly helpful, any further help would be great! Hey Dave – glad you liked the post! That’s an ambitious plan but probably possible–though the slog down the Dry Fork to the interesting part of Coyote Gulch will likely be long and exceedingly dull. Don’t rush it though–I’d give it at least 3-4 days in all. Andrew, great pics and wonderful info. Questions, we are 59 and 52 yrs old, both smoke, in decent shape, not athletic, but can walk a few miles no problem, she may not be able to climb, I do not know. Anyway we are not hikers, but do want to do this trip on July 3rd. Staying in Cannonville. I have hiked the Grand Canyon, uh some years ago (1983 84) to the bottom and back. any advice? I say we get there just as the sun rises, is the road good travel in the dark, I plan tp visit the visitor center the day before. My wife is 55 and I am 65, and are in good shape. We hiked in on June 13th, 2017. The hike down from the trailhead is marked by cairns creating a switchback path across the sandstone. No problem there. A little slog through a sandy area into the canyon bottom is next, and then you arrive at an opening of Coyote Gulch, with the Dry Fork on your left. Dry Fork requires the least work to pass through it, and no difficulties climbing the little ascent encountered. 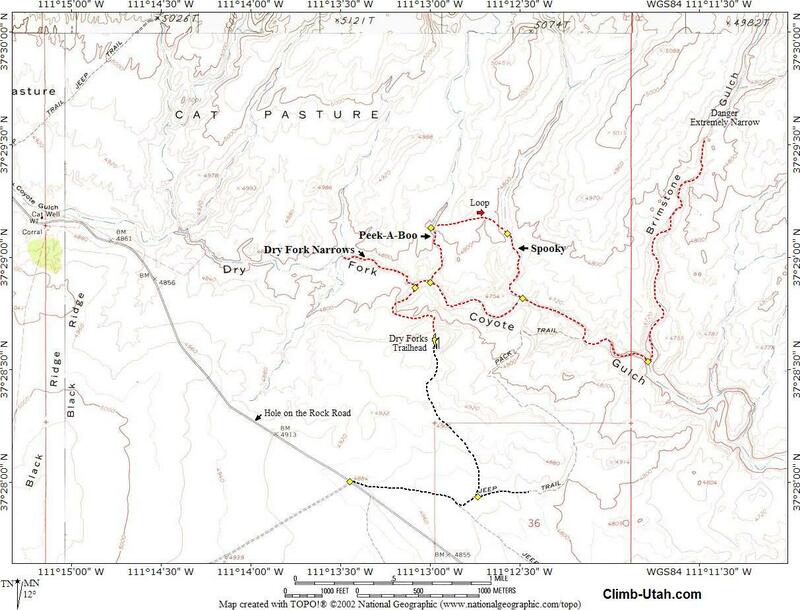 (See the hike for Dry Fork on this site.) 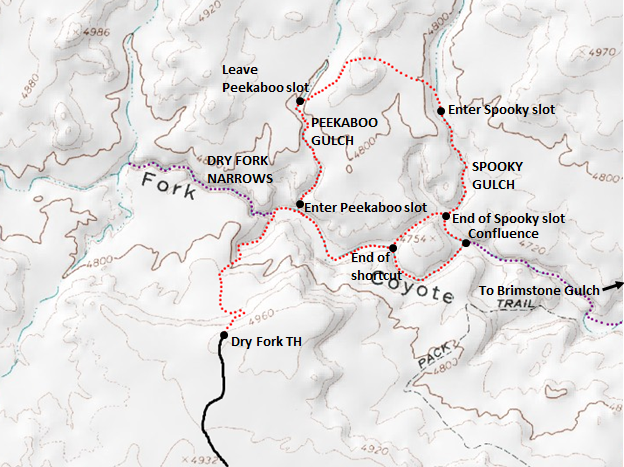 The hikes into Peekaboo and Spooky, as noted on the map, require a little more in the “climbing” department with the over the sandstone inter-slot routes, but very doable. Definitely check in at the multi-agency facility on the West side of Escalante. If you are lucky, Ranger Castro will be on duty–he is a geologist–and can inform you of current conditions, but the Hole-in-the-Rock Road should pose no problems. Hopefully, you will have a suitable vehicle for the last .9 mi of road to the trailhead. Have fun! Barring a recent rainstorm, the Hole-in-the-Rock Road should be ok, though as mentioned above, the Dry Fork Road likely requires 4WD (which is not a problem if you’re willing to walk an extra 1/2 mile or so). Check the latest road conditions here: https://www.nps.gov/glca/learn/news/road-conditions.htm. Thank you! This write-up proved incredibly helpful when my family visited Peekaboo and Spooky. Particularly after we saw a couple who had turned back at the “impassible” boulder pile in Spooky. This write up accurately refers to this as an “uh oh” moment as the “obvious” path is up and over the boulders which leaves you with a huge dropoff to the canyon floor. The solution mentioned here is to back up and go under the boulders. This still requires a bit of a drop which can be reduced with some upper both strength and some teamwork. I would say this was more of a challenge than the entrance to Peekaboo but maybe that’s just the pyschological difference of feeling comfortable and fresh at the start vs. feeling more fatigued and closed in. In dry weather, Hole-in-the Rock was very passable but it is about an hour on a dirt road that is mostly washboard surface. The last bit to the trailhead is another story. We did fine in a high-clearance 4WD vehicle but you definitely need to take it slow and I would not try it in a car with lower clearance. Just park at the first parking lot and walk the extra mile or so. We had the toughest time getting back to the trailhead from Spooky. There is a nice sign for the trail but we tried the “alternative route” which was a huge mistake for us. We ended up following apparrant trails with Cairns that brought us to faces that we could not descend to the Dry Fork. Instead it was a lot of backtracking in the hot sun until we found a portion of the cliff we could climb down. Going the “long” way would have taken us much less time. Overall, great experience, memories and photos. Thanks. Thanks again for your information. Valuable for my upcoming trip.